While Maruti Suzuki maintains the top spot, Honda too locks horns for the No.1 spot! In 2016, Maruti Suzuki India Ltd. just managed to retain its top ranking in the JD Power CSI 2016 – (India Customer Service Index) Study. However, it hadto share the No. 1 spot with another Japanese contender Honda. The JD Power Customer Satisfaction Index is one of the most reliable surveys which reviews the customer service related aspects. It includes Service Initiation, Service Advisor, Service Facility, Vehicle Pickup, and Service Quality. JD Power measures the manufacturers' rankings on a 1000-points scale. Against which, the automotive companies are compared for overall customer satisfaction. Thus, higher number of points means greater is the customer satisfaction. According to JD Power CSI, Maruti Suzuki retained the top position for the 17th consecutive year. This time, Honda also acquired the 1st position alongwith Maruti; whereas Tata Motors jointly holds a respectable 2nd place with Hyundai. Both the companies have maintained their service quality well above the market average of 880 points. Mahindra and Toyota moved up by a rank compared to the rankings of 2015. They bagged 3rd & 4th places respectively in JD Power CSI 2016. Nissan grabbed 5th place while the new entrant to this list - Datsun achieved 6th rank in its first attempt. Ford also improved its service and is now at 7th place in contrast to 10th place in 2015. Despite the emission scandal, Volkswagen which was at 11th place; moved up to 8th place. This might be because of its better service delivery in 2016. On the other hand, Chevrolet which was at 7th place in 2015 but moved down to 9th spot in 2016. 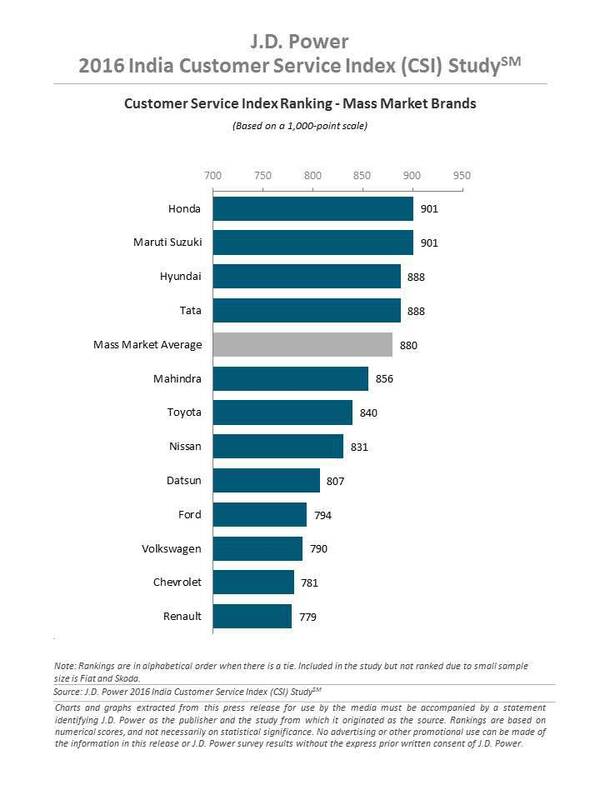 Similarly, Renault; which was at 9th spot last year slipped to 10th place in 2016 indicating that the customers were not happy with the company’s service. Furthermore, Skoda and Fiat India did not even make it to the JD Power CSI 2016 list which shows a vast decline of their service standards in year 2016.